If you have ever looked at recipes for homemade hummus or baba ghanoush, you might have asked yourself "What Is Tahini?" This tasty paste of ground sesame seeds is widely used in Middle Eastern cooking and is a key ingredient for many delicious dishes. In its most basic form, tahini is a paste of ground sesame seeds that is similar to American peanut butter. The sesame seeds are hulled and lightly roasted to bring out their fragrant aroma and then ground with a mortar and pestle (or a food processor in modern times) into a thick, sticky paste. This paste has been a major component of Middle Eastern cuisine for several centuries. It is mentioned as an ingredient in Hummus Kasa, a recipe that was featured in a 13th century Arabic cookbook. There are two types of tahini: a light, ivory-hued one and a darker, amber-colored one. The lighter version is considered superior in taste and texture, but both have their culinary uses. There are hundreds of uses for tahini, only a few of which are popular in the West. 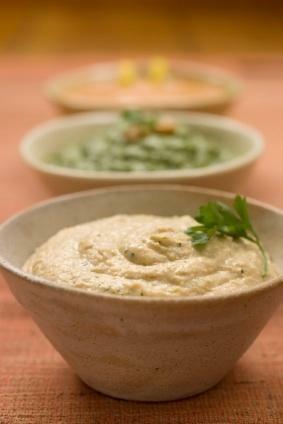 It is widely used in a variety of sauces and dips, such as hummus or baba ghanoush. However, Arab and Israeli cooks also use it as a side dish, a condiment for meat and vegetables, a soup base, or a spread for bread. A popular use for tahini in Turkey is in a dish called tahin-pekmez, where the paste is mixed with a molasses-like syrup made by boiling down fruit syrup. This sauce is then used at breakfast or after dinner as a dessert to dip bread in. A similar recipe can be found in Iraq where tahini is blended with date syrup to make a sweet dessert. Tahini is simple to make, and a homemade version is far superior to anything you can purchase in the store. Although it is important to note that homemade tahini has a different consistency than store bought versions. There are a wide variety of delicious dishes that use tahini. Hummus is a dip or spread that is made by cooking and mashing chickpeas and then blending them with tahini, olive oil, lemon juice, salt and garlic. It is extremely versatile, acting as a filling for sandwiches, as a dip for pita chips and grilled vegetables, or as a condiment for roast chicken or falafel. Drain the chickpeas and set aside the liquid. Combine all of the ingredients in a blender or a food processor. Add chickpea liquid while blending for about 3 to 5 minutes until thoroughly mixed and very smooth. Baba ghanoush is another popular dip or spread that is made with roasted eggplant, tahini, and a variety of aromatics. It is delightful with vegetables or spread on flatbread for a quick hors d'oeuvres. Score the eggplant in several places with a fork and place it on the grill, about four to five inches from the fire. Grill the eggplant, turning frequently, until the outer skin is blackened and blistered and the flesh feels soft to the touch, about 10 to 15 minutes. Transfer the eggplant to a baking sheet and cook until very soft, another 15 to 20 minutes. Remove eggplant from oven, cool and peel off skin. In a large bowl mash the eggplant with a potato masher or a fork. Add tahini, garlic, lemon juice and cumin and mix well until smooth. Season with salt and pepper and taste, adding more tahini or lemon juice depending on your palette.